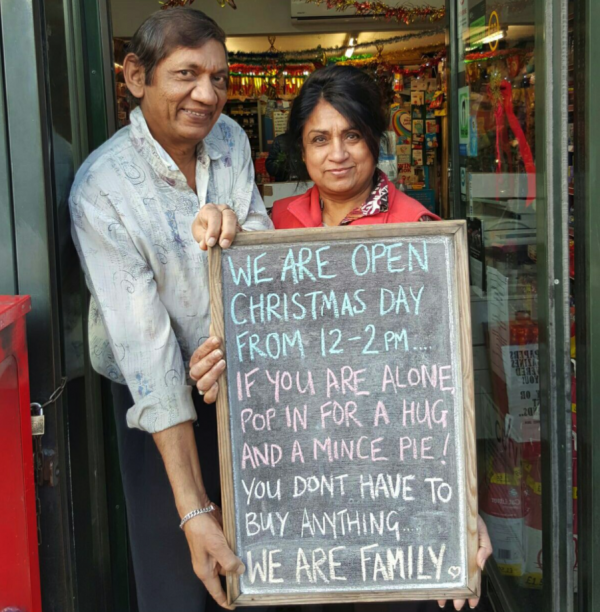 A couple who run a convenience store in a London suburb are keeping their doors open on their only day off all year to give people who have no one to share Christmas with a feeling of home and family. 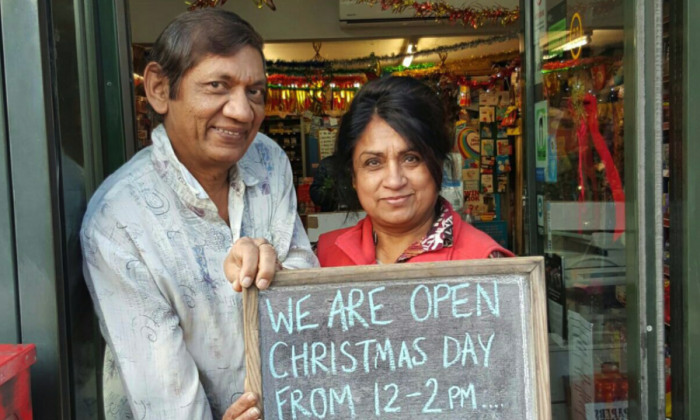 Shashi and Pallu Patel, who run Meet and Deep Newsagents in Twickenham, London, promise hugs, lots of free treats and all the positive energy you’ll need to last you until, well, next Christmas. 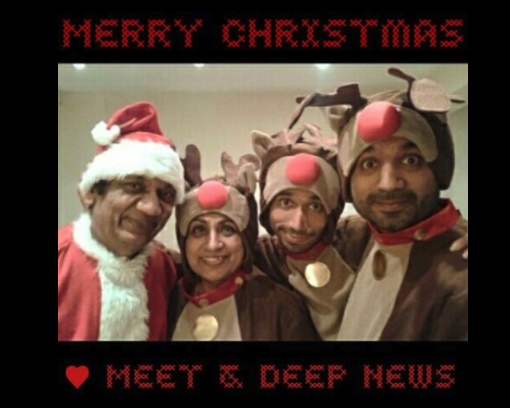 For two hours on Christmas Day, the couple and their two sons, Meeten and Deepen, will dress up in festive costumes, play carols and hand out cakes and sweets to anyone who pops in. “We do it to spread happiness,” said Deepen. He said it all started about eight years ago, after an elderly patron, Dot, was victimized by a con artist. A man posing as a central heating repairman had entered the 85-year-old woman’s apartment and robbed her of £800 ($1070) cash she had saved for Christmas. When the Patels heard about the incident, they organized a charity drive at their store on Dot’s behalf. They also organized a Christmas Day get-together and gave her a Santa Claus sack full of goodies that people from the community had donated. Dot said of the day: “I never had a Christmas this good!”, according to Deepen. The rest, he says, is history. “We thought it was such a good thing to make someone happy, why not do something like this every year?” Deepen told The Epoch Times. His brother came up with the idea to use a blackboard and Facebook to get the message out more widely. Initially, the Christmas Day bash at the store was for elderly people, who have no family. But Deepen said they were surprised when younger people started showing up. He also told of a woman who walks 45 minutes just to show up at their Chrismas Day event, because she’s all alone. “If we can be someone’s friend, so they don’t have to be alone, then let’s do it,” said Deepen. Last year, several hundred people showed up, Deepen said, and this year he expects more. “Some people started calling ahead, asking if there’s space for them to join in, or if they have to pay,” Deepen said. He says there are even special goodies for vegans or for people with nut allergies. “It’s a message of love and to share love is the best thing to do,” he said.